Thread: What should the best controller have... and why isent it built already?!? Two days ago, I was sitting together with my family for christmas. My cousin, who´s also a DJ, asks me which is my favourite equipment... or the equipment of my dreams...??? So I´ve gone into myself... I started DJing 3 years ago with a controller. But 1 year after that, I moved on to CDJ´s. But rekordbox was so anoying to me (it takes very long to scan your tracks and they are saved on usb in a special format... so you can´t use the stick in your car or anything like that... you can just use it with CDJ´s) and I hated these club-CDJ´s (which are used every weekend for years, so every slider and button is loose... if they work). I moved back to controllerism an bought myself a pioneer ddj sx. So if I consider to my perfect equipment... It should definitly be a controller, which I could carry around. 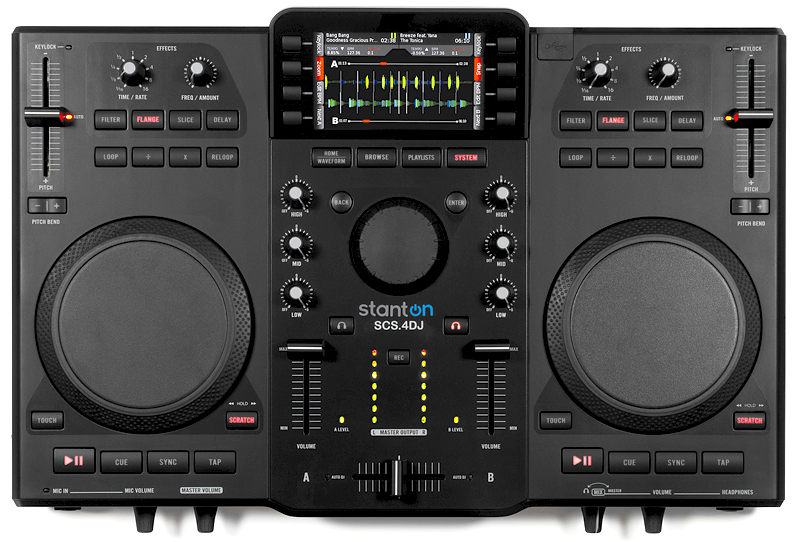 So the size has to be between the Kontrol S8 and the Pioneer DDJ SX. The SZ is definitly to big and heavy. If you come to the club, there is maybe a DJ which uses CDJ´s. A other one uses Timecode. So you can´t come over with a Pioneer DDJ-SZ and say: Clean the table!!! I think Pioneer is on the right way, with their XDJ... A controller... with its own software... screens... and the ability to hook up USB... Thats really could be the next level. Native Instruments for example... They have their own software, so why don´t bring it together with and on the hardware... So you could connect your music via USB... arange it on the screens... and play with or without laptop. I know what I like, and I get why other people like other things. That being said, I don't get screens on controllers. Maybe it's just because I haven't really used one. But until a modular with screens comes out, I won't. I'm going to take a wild stab here and guess that it comes down to cost. Native Instruments could probably design a "best" controller, but in the end, these things have to be balanced by R&D costs, hardware costs, and fit with what people will actually buy so they make their investment back. and fit with what people will actually buy so they make their investment back. Which is completly different from person to person therfore is impossible to do. Its like asking "why hasn't someone just made the best electronic song ever yet?" I'm telling you, a Kontrol unit that displays images of LOLcats based on the music you're playing would be golden and move millions of units! Also, the thing that the OP wants was built a while ago...it's called the SCS.4DJ, and it was a tremendous sales failure for stanton. You could say that it was because of sub-standard feel, bad effects, or any host of other flaws the thing had. But I feel like there would have been more "please make this actually good" requests, blogs, and forum posts than the basically zero that happened. Honestly, I always wanted to like the thing. And I could easily play on it, but it'd be too many sacrifices compared to basically every setup I've ever had. But I feel like there would have been more "please make this actually good" requests, blogs, and forum posts than the basically zero that happened. Basically IMHO they tried to cheap out by making the software do everything on a really cheap CPU, resulting in it just doing everything really badly. Hell most android phones clock higher than it at this point. Great idea killed by bad excecution. I like the xone controllers , use the s2 myself. I have gotten rather comfortable with it. My friend has the xone's and I would probably use those over the s2 but my purchase has been made and I will probably stick with the S2 till it drops. I went through TT's and CDJS b4 the controller route and just prefer it. <been at it for 6+ years. So, to make my ideal all-in-one, you'd have to make a lot of changes to the software as well, which (if the unit is running software) is well in the realm of possibility. Here's what I'd do. Weld a pair of X1mk2s on the left and a pair of F1s on the right of a blue Rane Empath Rotary with a better-fitting face plate. Since it's running it's own version of traktor, I'd want it to route 3 track decks (ABC) to the empath's channels, 1 remix deck to the mix bus at unity gain, and the remix deck's monitor line to the headphones at unity gain. Ditch the Empath's EQs, metering, mic channels, gain knobs, crossfader, etc., and recover the space by moving the channel knobs down a bit. I just want level controls, monitor controls, and master/booth output controls. Add a 3-band master isolator at the top of the mixer, based on rane's progressive-slope EQ. Add in a stereo pair of small but readable, backlit analog VU meters that I can calibrate easily and accurately under the isolator, tied to the mix bus level (not the output level). Add in 7-segment LED meterss (4 blue, 2 greeen, 1 red) for each of the 3 decks and each channel of the 1 remix deck, and make them follow the VU meter's calibration ( first green = 0VU, red = +4 VU, first blue = signal audible above the mixer's noise floor ). Use good pots for the levels, so 0 is silent and the track kicks in by 1, not 3 as they are on my 2016. Unity gain at 8. Same with the master/booth output except I think unity gain should be at ~6. Change Embeded-Traktor's auto-gain to use LUFS based on the current american brodcast standard, which builds in enough headroom for the effects and everything else to work right. Map the X1mk2s for beat jumps instead of hot cues (HCs available via shift+flux). One of them should control Xone Filters (assigned nonexclusively to decks with the buttons beside the knobs). The other should control 4-band EQs based on the xone model's crossover points, assigned the same way. Remove Traktor's stupid and pointless "coloring" based on the xone EQ model. Leave the first F1 exactly as stock. Move my keyboard controls for deck copying (via instant doubles) and deck unload to the second F1's main mode. Allow the user mode to be used for something like instant-gratification effects, though I don't actually like the effects chosen for that mapping. Expand Traktor's S8 remix deck effects sends to work for decks, and use the second F1's faders (motorized in my fantasy world) for effects sends. Replace that F1's nobs with encoders and use them for effects controls, with the encoder/LCD set to tell me which effect unit I'm controlling. Use the buttons in the center section for effects presets and selection. Let me use plugins for effects....support at least VST and AU formats. And since the thing is running all it's own software, let me put the GUI on a screen off to the side with a cable, not wireless, as opposed to having the screens on the device and begging me to stare at it. And give me good mapping software that I can run on a laptop. Give the thing reasonable internal storage. Considering the cost of everything else, a pair of 256GB SSDs in RAID 1 seems reasonable. Let me copy music to it via USB3 or LAN, but I want to do all the track preparation on a companion app on a laptop. Also, let me back up it's settings, music, and everything else to USB keys. Also, change the mixer to digital. And give me a digital master output via s/pdif and LAN (straight off the mix bus, not affected by output analog gain controls). That would be my ideal DJ console. And, really, they only real differences (in use) between that and my current setup are that it'd be more portable but harder to squeeze into a booth, harder to fix if individual components broke, harder to update, and have better IO. It would also probably be more expensive, harder to update if I eventually decide to integrate something like Push or go back to Maschine, generally wouldn't be worth it. And I think I'm the only person on the planet that would want one. That should be Stanton's motto. Last edited by mostapha; 12-31-2014 at 02:38 PM.